Gods and Goddesses are coming back in Marvel's Eternals movie. Angelina Jolie, who won an Oscar for her role in Girl, Interrupted , is in talks to join the upcoming feature film adaptation of Jack Kirby's The Eternals , according to Variety. The film, which is coming from Disney and Marvel Studios, will be directed by Chloe Zhao. 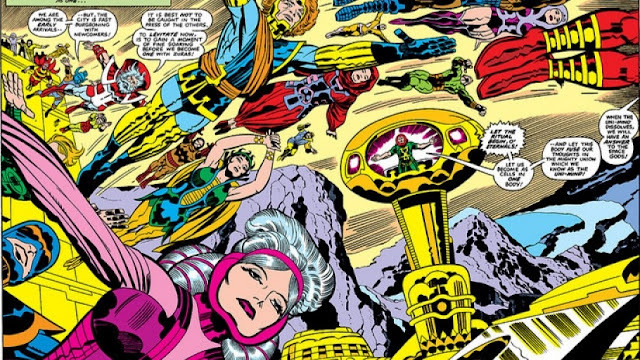 The Eternals are a hidden race living on Earth, and their creators were space gods called the Celestials who visited earth 5 million years ago. They performed genetic experiments on early forms of life on earth, giving them cosmic powers and near-immortality. The Eternals were created as a force for good, and they are sworn enemies to the Deviants, also created by Celestials. Eternals and Deviants have been around for thousands of years and are often mistaken for local gods and other mythological figures. Eternals are impossibly beautiful, while the mutated Deviants are grotesque - they act like a cult and think the world was made for them. You may remember that the Eternals mythology was mentioned briefly in the Guardians Of The Galaxy films, setting up their introduction in Phase 4. There is no word yet on who Jolie will play, unfortunately. She will next star in Maleficent: Mistress Of Evil , one of four live-action feature adaptations coming from Disney this year, along with Dumbo, Aladdin and The Lion King. She'll also star in the live-action/animation hybrid The One And Only Ivan . Chinese-born filmmaker Chloe Zhao ( The Rider, Songs My Brother Taught Me ) is currently in post-production on the film Nomadland , which stars Frances McDormand. The Eternals movie is expected to feature Marvel’s first openly gay character. Marvel currently has nine untitled movies on the release schedule between 2019 and 2022, but no release date for Eternals has been announced.